Finding a top doctor isn't always easy, especially in a big city such as Los Angeles. 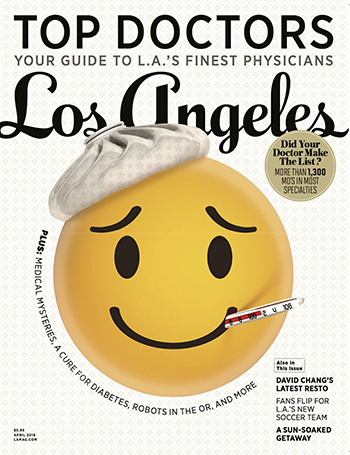 Los Angeles Magazine decided to help, recently producing its first list of "top doctors." The result: more than 150 UCLA Health physicians have been designated a "Los Angeles Top Doctor." The results were based on a peer-to-peer survey of practicing physicians throughout Los Angeles County, who were asked to identify the doctors they consider to be at the top of their game. "The idea is to tap into the wisdom of professionals who know medicine and know the people working within it," the magazine explained in an accompanying editorial. Leadership of UCLA Health and the David Geffen School of Medicine at UCLA were pleased, if not surprised, by the results. "Our physicians exemplify – every day -- UCLA Health's mission of delivering leading-edge patient care, research, and education," said Johnese Spisso, president of UCLA Health and CEO of the UCLA Hospital System. "This acknowledgement highlights the expertise, commitment and compassion that UCLA Health physicians have for delivering patient-centered care." The fact that the acknowledgement comes from physician peers makes the listing even more meaningful. "This is a remarkable accomplishment, and we are extremely pleased at the recognition from other respected physicians within our community," said Dr. Eve Glazier, president of the UCLA Health Faculty Practice Group. "In many ways, the list also shines a well-deserved spotlight on the overall accomplishments of our faculty." If the numbers themselves weren't enough, physicians and programs at UCLA Health and the David Geffen School of Medicine at UCLA were spotlighted in three "medical frontier" features accompanying the list: on the UCLA International Medical Graduate Program, on the Undiagnosed Diseases Network, and UCLA's Neuroplasticity and Repair Laboratory. Search the magazine's listing here – or simply search for a physician in the UCLA Health Provider Directory.